It’s time to cut the crap, trim the fat, and focus on online markting strategies that work. The fast-paced world of digital marketing -- with all its technological advancements and iterative improvements -- has theoretically made marketers’ lives easier. But the flip side of the coin is that marketers are overwhelmed. It seems like every week there’s something new we absolutely must be doing, lest we get left behind. But a lot of this new “stuff” is now outdated. Or worse, was never a good use of time and budget to begin with. To help transform you into a more efficient marketer, we're sharing 10 things you can cut from your marketing today, as well as where you should be spending that previously wasted time. 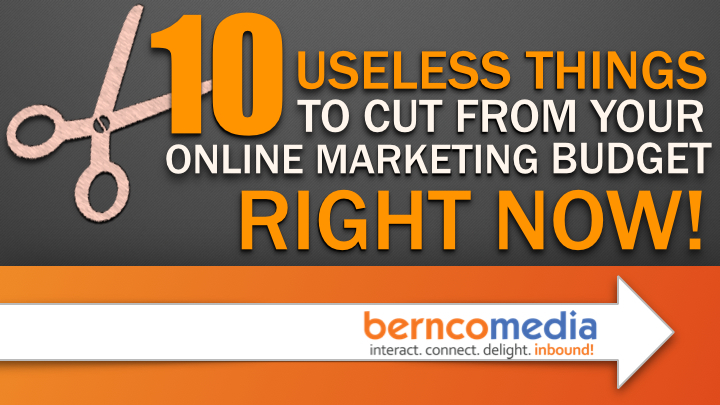 Grab your copy of the 10 Useless Things To Cut From Your Online Marketing Budget. Right Now by filling out the form on the right!